Ah, remember the good ol’ days of spring break? Beaches and bonfires and day drinking. Those were the days, right? Well, take all of that....and then throttle it down to about 35-85%. Throw in some crafts, some kids (in my case nieces) and a cool bedtime of about 10pm and you’ve got yourself a good ol’ fashioned Spring Break in your 30s. Partyyyyyyyy! Jk Im tired. Anywho, let's make some sea shell candles! And then take a nap! The whole "melting the candles in the pot" step is questionable at best. Mostly because you have to dig out the wicks while the wax is melted in the pan and it just gets kind of messy and weird. So...you could just get candle wax somewhere and melt that down and also buy wicks somewhere and put those in the candles separately. 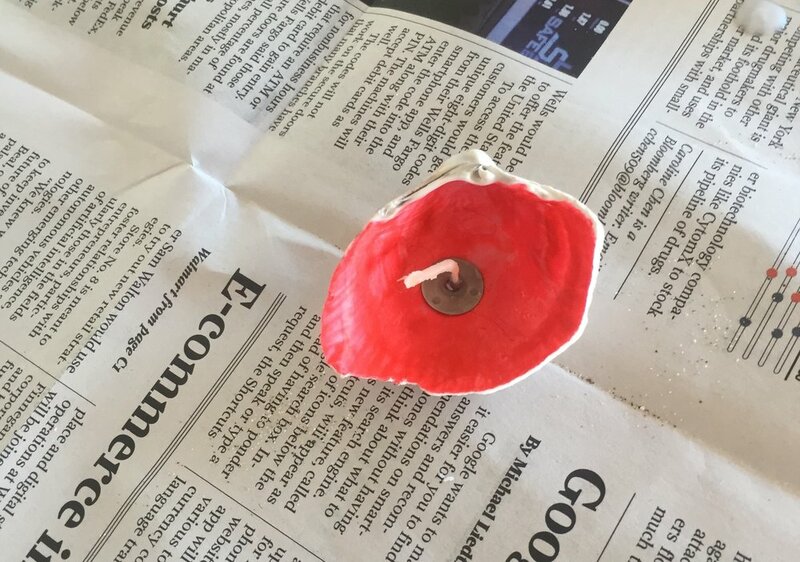 OR you can melt down wax and pour it over a solid unmelted candle already in the shell. And that's basically the whole craft! Keep reading though? If you have a crock pot - great! If you have a double boiler - also great! If not, you have to use the janky/not safe double boiler, which is a boiling pot (I still don't know what this is called) on top of a frying pan. But you HAVE TO HAVE WATER in the frying pan AT ALL TIMES because apparently the wax CAN CATCH ITSELF ON FIRE. Especially with a gas stove. Also you have to watch the wax because if it gets too hot it will SPIT AND BURN YOU. Probably should have led with this (talking to you mom/grandma who suggested this craft - "It's so fun though!"). You don't have to paint your shells. Some shells are pretty without paints. Jk how dare you neon all day. You can also melt down crayons. SO MANY OPTIONS. This is really making me realize how questionable my crafting is. No wonder there are so many injuries both physical and mostly mental. Is Aunt Emma drunk or can we craft? 1.) Collect your shells yay! Easy and fun! Then cover your table in paper because we are a sensible and prepared bunch over here. 2.) Paint your shells if you want to! Or don't. But if you do, maybe do it before you put your wax in? But hey, you do you. No judging in Crafty Hour. NEON ALL DAY. EVERYTHING IS BETTER WITH NEON. 3.) Start to melt the candles! Yay! But also please be careful and pay attention! Especially if you're using the janky double boiler option because of the fire and the pain. HA. This is great. So glad we're doing this. 4.) When there's enough of the candle melted, remove candles from the silver tin things. I just kind of grabbed the wick and pulled the rest of the candle out of the tin. See above. Sort of? 5.) Now remove the wicks that are floating around in your hot lava wax. I used a fork and sometimes my fingers. I can tell you which hurt less. Forks. Forks hurt less. But are also slightly more annoying. 6.) Put the wicks (and/or full tea light) into a shell. yay mostly easy and fun. Leftover wick in NEON candle. SPOILER ALERT. 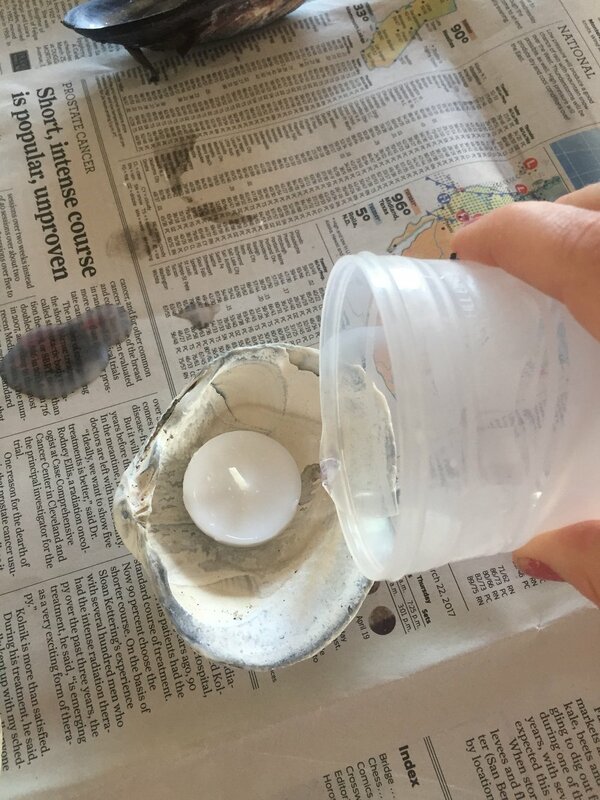 But here's a pic with the whole tea light in the shell (and then with the wax poured in SPOILER). 7.) Pour the wax into your candles! There are various ways to do it (2), as I will show you now. Pouring from the pan. Which is somehow safer than the other thing we did. Pour it into a plastic (wtf?) cup and then pour it into your shell. But hey look, an option where we have the candle in instead of the wick. 8.) Let them dry! Finish your drink! Take a bubble bath with your dope candles! K one more cuz it's so pretty. Part II - Putting a Spring in Your Spritzer Step! Pour your super chill white wine into your 3/4 of your glass. Fill the rest of it with Ginger beer. Garnish it with lime (squeeze some juice in there too while you're at it). Garnish with whatever fruit you have lying around that the kids haven't gotten into. Enjoy! Sure, there's a garnish on there. Well I have a rule that once a inaccurate fact enters a blog, it's time to wrap it up. I hope you enjoyed this weeks(ish) Crafty Hour and it brings you hours of friendship happiness.